El Gigante: A Real Wrestle Maniac! Well, it caught my attention! I mean, common, it’s a homicidal luchadore! So, I contacted the team behind the film (directors Gigi Saul Guerrero and Luke Bramley and producer Raynor Shima) to try to find out more about it. Here’s how it went! Johnny Macabre: Thank you, Gigi, Raynor, and Luke for taking the time for this interview. Now, you are the team behind the upcoming film El Gigante. Can you tell me a little about it and about what each of you did? Gigi Saul Guerrero: Gigi – Yeah!! El Gigante short film is based of the first chapter of Shane McKenzie’s novel “MUERTE CON CARNE” (Death with Meat). Our goal was to use that short as of proof of concept to adapt the rest of the novel and make the feature film! The short film has had so much success its been an amazing journey. Working with Shane on the feature script is truly a blessing. Luke Bramley: And served at co-director, director of photography and co-editor, and I’ll also be the cinematographer on the feature film. Raynor Shima: I’m the Producer on our films which is mainly my main focal point when it comes to our team work. But I also dab in Production Design (Which I did for El Gigante) as well 1st A.D. our sets. El Gigante was such a great experience for us as a whole team. We really pulled out all the stops in each department to come up with a film that has been adapted from a novel, to really get it out there to a wide audience. JM: Alright, great! A real team effort then! Now, I don’t know much Spanish, but I think El Gigante means “The Giant”, yes? How does that feature into this short film? What can you tell me about the plot? LB: Yes, it does mean “The Giant”! That is the name of our main villain, a deranged Luchador wrestler who tortures his victims in his makeshift wrestling ring while the rest of his family salivates with enthusiasm, because once the victim is beat to a brutal pulp, his meat is used to feed the family! RS: Yes it means “The Giant” in english, but sounds much cooler when you hear it in Spanish :P. Basically El Gigante is the first chapter of Shane’s novel ‘Muerte Con Carne’, so what we did was adapt it into a short film. So we could use it as a proof of concept to get the story off the ground. 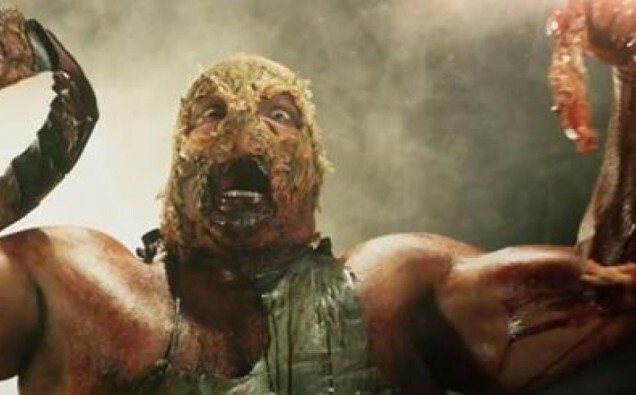 LB: Think of it as The Texas Chainsaw Massacre meets Lucha Libre wrestling! JM: I was just going to say I am getting a real slasher or TCM vibe from it! Which is something I love. (got the link. I’ll take a look and include a review with the interview). So, what made you guys want to adapt this particular book? RS: Its funny that you mention the TCM vibe, because for us, thats one of the greatest things about this novel that it shares its similarities with. This story has similarities to TCM, and The Hills Eyes. When reading this book, it just screamed that iconic horror character that we’ve been yearning for, in such a long time. Also it just has so many great moments that will translate on screen for people, that will leave them going WTF. The content and visual aspect of the world, along with the family is whats going to make this such an amazing film. GSG: Also to add to what Raynor said what stood out for us the most is that the style of the novel is totally up our alley! It has such a dirty gritty feel to it such an “Devil’s Rejects”! Gigante’s family is so interesting and morbid the audience will cheer and hate them at the same time. LB: It’s definitely the style we love: gritty and dirty, with an iconic villain and a Tex-Mex vibe. We were introduced to Shane McKenzie through another horror author/filmmaker named John Skipp, who thought our style of filmmaking would match Shane’s book. When we read his book we were immediately fans, and he loved our films, so it was a match made in heaven! JM: So he was already familiar with your work! That must have made getting the rights a bit easier. So, what’s next? You want to do the full movie, when can we expect to see that? What are your obstacles? RS: Well 2 weeks ago, we’ve announced that Raven Banner Entertainment has come on board for Worldwide Sales and Canadian Distribution, during the Fantasia Frontiers Market in Montreal. It was such an amazing experience for us to even be there, also at the same time has opened up a few more opportunities in making the feature happen. We’re so glad to have Raven Banner behind us on this project, as it will lead into a better chance of securing financing for our film, from investors. In this process we are going to have to stay vigilante and always keep pushing ourselves forward when it comes to getting a feature made. Finding the right locations, actors, building sets, and constantly planning it to the best of our ability, will always be a challenge for us. But we are definitely welcoming that obstacle. We hope to be making this feature next year, somewhere around May-June, 2016. JM: Alright, awesome! You guys seem very dedicated to the project! Thank you again for taking the time for the interview. Before I let you go, is there anything else you would like to tell the readers? GSG: Thanks for having us!! LB: Yes, and we also love to hear from our fans, so please check our social media sites out for updates and feel free to let us know what you all think! RS: Thanks for having us! JM: Great! Well, thanks again, guys, and best of luck in your future endeavors! After the interview, I had the opportunity to watch the film and I can only say that it is pretty brutal. Impressive practical fx and great production values! Really looking promising for the full feature! Check out the trailer!